Achilles tendonitis is an inflammation, and associated pain, of the tendon that runs along the back of your leg. This inflammation causes pain along the back of the leg. Usually found in amateur or professional athletes, Achilles tendonitis is usually caused by the overuse or degeneration of this tendon. The Achilles tendon is the longest tendon in your body. It runs the down the lower half of your leg, from the calf muscles to the heel and is used for walking, jumping and running. Although the tendon can cope with the normal stresses of exercise, it can be overworked which will bring on tendonitis. Noninsertional Achilles tendonitis involves the middle part of the tendon beginning to break down with tiny tearing. This causes the tendon to swell and thicken. This type of tendonitis generally affects younger, active people. 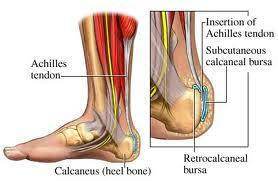 Insertional Achilles tendonitis affects the heel. This tendonitis is caused by the tendons pulling away from the heel bone. 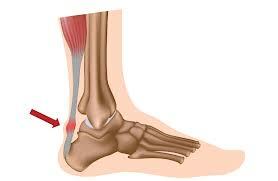 Insertional Achilles tendonitis is most commonly associated with bone spurs where the tendons calcify and become hard. Generally, this type of tendonitis affects both active and non-active patients. A sudden increase in your exercise activity. Whether it is increasing the level or duration of the exercise, if you haven’t given your body the time to adapt to the increased activity, it can cause the Achilles tendon to tear. Failing to loosen the calf muscles correctly prior to starting intense activity can put additional stresses on the Achilles tendon. If previous injuries or inflammations have encouraged the growth of bone spurs, these can rub against the tendon and cause additional injuries. Treatment options for Achilles Tendonitis involve both non-surgical and surgical treatment. The surgical option would only be attempted if the non-surgical treatment fails to work. This treatment, a variety of rest, medication followed by exercise treatment will provide relief from the pain, although it might take months for the symptoms to subside. The longer you wait to seek this type of treatment, the longer the pain may last. In some cases, the pain can last up to six months. In severe cases, it might lead to additional damage that can only be repaired through surgery. If the pain is still present after 6 months, surgery might be recommended. Depending on your treatment and the doctor’s recommendation this surgery can target different aspects of the tendonitis to minimize the lasting damage. In its early stages, Achilles tendonitis can be little more than an annoyance, but if left unattended, it can easily expand into a major health problem affecting your entire quality of life.